THE WRITING BUDDHA - Opinions | Books | Movies: You're Trending In My Dreams by Sudeep Nagarkar (Book Review-1*/5) !!! 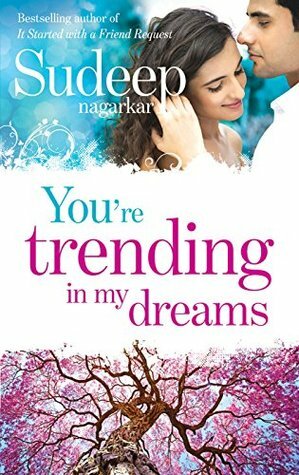 You're Trending In My Dreams by Sudeep Nagarkar (Book Review-1*/5) !!! Sudeep Nagarkar is now 6 books old in his writing career of 4 years with his latest release "You're trending in my dreams" which has already hit the Bestseller chart and has become his one of the best openings in terms of pre-order and initial sales. Penguin Random House had added many romantic writers in their list of annual releases some 3 years back and since then, each author co mes out with a novel every year. It has become more about marketing propaganda than quality for which these big publication houses are known for. Sudeep Nagarkar had improved with time as a writer and he had finally started writing mature stories based on youth but I think the target given by publishing house to complete the book by a particular deadline are making these authors write a story in a go without giving much research and time to overthink and make it better. YTIMD is the big example of the same. It stands no where even if compared to Sudeep's first book as a writer where he has scribbled his own story without much creative inputs. The ratings that I have given to Sudeep Nagarkar in order of his releases are as follows: 3, 2.5, 3.5, 4.5, 3.25 which shows that he had almost become stably good in his performance with each book but I am very scared to even talk about his new release as I never believed it could be so plain with no great story, no memorable characters, no great twists and turns and no great climax which can either make you emotional or shocked or glad. It is very childish and written similarly as a junior college student writes his personal diary with few poems, few philosophical sentences which are cliche and known to everyone, talks on how girls are treated like an object etc. I have always liked an ability about Sudeep of picking up a location and doing pure justice with it and also describing the youth as similar as possible as they really actually are. This time he picked up Navi Mumbai and didn't discuss it quite well and also, the characters aren't built keeping the location in mind. It looks as if it's about the crowd from Lower Parel or Churchgate and not from Navi Mumbai where boys and girls still aren't that modern to share a room together. Initially, the book picks well and the way it starts, it seems as if Sudeep is going to deliver another great story but the way it becomes quite obvious after a point of time, it starts irritating a fan in you. Finally, the main twist arrives and the book does get better but again, how easily the whole issue is handled becomes the drowning point of this story. I didn't feel as if Sudeep have written this story. Seriously! As I have discussed above, I feel publishers should give time to these writers who are actually making Indian youth read month after month rather than giving them targets like releasing a book every 8th month or so. Give the author plenty of time to research, prepare, write, edit, write, edit and finally review his work, share it with his close friends, get their reviews, again edit the story and build the final manuscript. I give this book just 1 star and I wish Sudeep bounces back with his next book as a fan in me is largely disappointed this time. I am waiting for one of my favorite authors to write better than his best work till date.